Patriarch of the Kalsi Empire, Late. 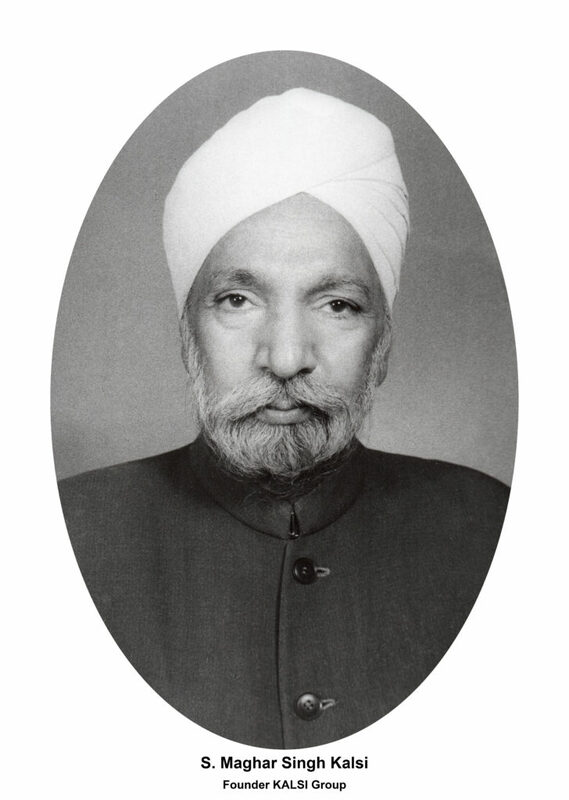 S. Maghar Singh Kalsi, an enterprising first generation entrepreneur, shifted from Lahore to Jalandhar in the year 1947, during the partition of undivided India. In lieu of the electric fan manufacturing unit, left behind in Lahore, he was allotted a hand pump manufacturing unit in the year 1948. The day he unlocked the shutters of this unit, customers started pouring in making sales inquiries. This prompted him to start manufacturing hand pumps under the trade name ‘KALSI’. This laid down the foundation of legacy of the KALSI Group. Having no experience in manufacturing hand pumps, our patriarch’s shear hard work and resolve to produce the best quality products brought him success in this venture. Making use of his innovative manufacturing techniques and machinery, he soon excelled in the hand pump market. The quality was well accepted and appreciated by his customers pan India. Prompted by encouragement of his customers and dealers, he soon ventured into manufacturing his first Centrifugal Pump in the early 1960’s. India had ushered in the era of Green Revolution in 1967/68, centrifugal pumps were in great demand for irrigation purposes. His decision to venture into these pumps proved to be a major milestone in the history of the organisation. These pumps were a roaring success and defined the road map for the future success and growth of the organisation. His un-timely demise in the year 1971, saw the passing on of the baton to his four sons. Ever since his sons have carried on his legacy of success, hard work and most importantly to not compromise on QUALITY. An organisation which started it’s journey as a hand pump manufacturer, is today better known as one of the largest pump manufacturers of North India. Our product portfolio has diversified to include products such as Submersible Pumpsets, Monoblock Pumps, Centrifugal Pumps, Domestic Pumps, Reflux Valves and Electric Motors used for application of Agricultural, Domestic and Industrial purposes, Rigid uPVC pipes, Bathroom fittings, Water Lifting apparatus for Indian Railways, and so on. National Award for Quality Products for Electric Motors – Year 1988 awarded by the Ministry Of Industry, Small Industries Development Organisation. National Award for Quality Products for Centrifugal Pumps – Year 1994 awarded by Ministry of Industry, Small Industries Development Organisation. National Award for Quality Products for Centrifugal Pumps – Year 2002 awarded by Ministry of Industry, Small Industries Development Organisation. National Award for Manufacturing Outstanding Quality Products for Submersible Pumps – Year 2010 awarded by Ministry of Industry, Small Industries Development Organisation. The Management of Kalsi group believes in dynamism and change. This is the reason we introduce new products from time to time. Today we have the latest equipment including computerized machines for designing, manufacturing, and testing. We have a team of well qualified and experienced Engineers along with fully equipped computerised labs. We are committed towards energy efficiency, high output and long durability to achieve maximum consumer satisfaction. We have a widespread network of sales having Dealers and Distributors spread all over India. Our dealers are fully equipped to provide any kind of after sales-services to the customers. Present range of products being manufactured by Kalsi group include a wide range of Submersible Pumpsets, Monoblock Pumps, Centrifugal Pumps, Domestic Pumps, Reflux Valves and Energy-Efficient Electric Motors used for application of Agricultural, Domestic and Industrial purposes. Most of our products are ISI marked by the Bureau of Indian Standards. Submersible pumpsets and Openwell Submersible Pumpsets are star-labeled by the Bureau of Energy Efficiency (B.E.E.). Our quality policy defines and reiterates the future road map of our organisation. We at Kalsi Metal Works Pvt. Ltd. shall strive to achieve leadership in design, development and distribution of various water pumping equipment, through continual improvement towards excellence and customer satisfaction.